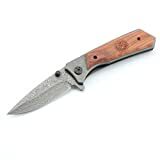 If you are a person who loves outdoor adventures like trekking and camping, or fishing and hunting, then you must know how important a knife can be for you. In the wilderness, it can be your saving grace and your only survival partner. A knife is a sharp tool and one needs to be careful while using it or even carrying it. The best way to do that is have a covering for the knife, or you could go ahead and purchase a sheath knife. If you have such a knife, then it has a dual advantage. If you have a good-looking knife, then you must feel proud of the owning such a knife. This improves the aesthetic value of the knife so that you can even display it for others to see. A good sheath ensures that your knife’s blade does not come in direct contact with your skin, which can cause nasty cuts. A good covered knife ensures that you are not harmed under any condition. If your knife has a covering then you can carry it in any part of your body which improves its stealth quotient. This enables you to carry the knife concealed along any part of your body. Even if you are not related to any stealth operations and just love adventures, the covering makes the knife convenient to carry in your backpack or on the body itself without the tension of getting cut. As the blade of the knife is exposed to the elements of nature on your outdoor adventures or stealth missions, it starts to lose its sharpness. If you have a good covering for the knife, then the knife can be protected from the forces of nature for a long time. The covering is that one thing that protects not only the person carrying the knife but also the blade itself. So, it is imperative that you choose a proper covering for your knife. If you buy a covered knife, then you can be sure that the covering is a perfect fit and has been designed to protect both the wearer and the blade. ·Make sure that there is something in the covering to stop the knife from travelling too deep. It should have a guard because the knife is stronger than any covering. Make sure that the covering stops right at the blade-handle junction. Another added advantage can be the presence of a wood or plastic liner. If you have an upswept blade, then a welt should be present. A normally folded covering is never a good option for such blades as these have a disadvantage where the tip can cut the fold and endanger your life. There is always a chance of the knife falling out of the covering if not secured properly, but retainers may be cut as the knife is removed and put back into the covering. A double retainer in your covering is a good idea. Pouch sheath is always a better type of covering for your knives. This eliminates the chance of the straps coming undone and offers trouble-free access. Stores around the world offer a wide range of covering that is made of various materials like leather, Kydex and nylon to name some. Choose the sheath of your knife well to ensure that your knife stays protected and keeps you safe from the sharp blade too. Whether you want to spend time with friends and family or catch a good dinner then fishing is a great way to enjoy the outdoor fun and come head-to-head with a vibrant array of fish. With the right gear and a little know-how, you’ll be sharing fishing tales with the old-timers before you know it. Fishing is the activity of trying to catch the fish.Many of techniques used to catch a fish. 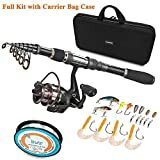 Fishing is the adventuring event for everyone because during fishing you enjoy the weather of water and also the view of fishing where you go for fishing. Before starting the fishing, you want to know the basic procedures of fishing. Once you have some reading the under your belt and then you can start beginning some pre-fishing skills. In which get the familiar tasks like adding hooks, fishing bait, casting your line and tying knots before drifting with the wind in your boat. Before you catch the first fish you must know the cast that first line and make sure you have a general idea of what you are getting into yourself. There are many of fishing fascinating books that can all put but you right in the middle of the action before you even make or pick up a pole. In the fishing, beginners will benefit the most from a specific rod and reels that are simpler for someone who is just beginning to cast. 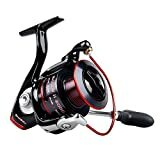 Open-faced fishing reels are never recommended for somewhat just starting out. In fishing have an idea of where your fish have chosen to spawn and find these locations to lead a great fishing. Also, a better overcast can lead some of the most successful and enjoy fishing trips.While you can still catch fish in other weather forecast or an overcast sky has proven to be the best. In successful fishing bait have major role be aware of what fish you are trying to catch and what kind of bait attracts them. For example, in fishing of catfish, catfish respond to either specially made bait for raw chicken liver while bream fish like insects like crickets or even a catfish. The wrong bait could mean a long fishing trip. In dressing for the fishing boot are most important.As you will usually be required to be near water, boots will be beneficial for the times that you will have to unexpectedly wade into it. Moreover, make sure you are wearing layers as the weather can drastically change until the afternoon.If you have longer hair, it is a good idea that you wear it back in a ponytail. During the trip of fishing if you want to pay constant attention to your children then try to not bring them with yourself on your fishing trip. However, in order to bring home your fishing fish, you must have an optimal concentration of children. Going for fishing then bring a lunch. Since this will most likely be your first fishing trip because sometimes it can take quite a while before you even get the first bite. During fishing bug spray have more importance if you are near water then you are even closer to bugs like mosquitoes. Remember to carry the bug spray and you should be itch free. After you caught the fish then there are many works to do once you caught the alive fish during fishing. There is no reason for why the fish we catch at sea cannot be in prime condition when we start preparing it for the serving table as a meal. Simple facts are that to produce the table fish in better condition to be served in a very simple process. There is some process which gives you better fish after you caught. Given below. First, before fishing, you have to do fill an insulated chilly bin with lots of ice or with ice but there is the best suggestion to use the Saltwater ice because it is best for fresh fish. In next step when the fish come over the side and kill them straight away, preferably with a sharp implement for killing a fish. A sharpened screwdriver works well into the brain or in a solid whack over the eyes with a club. In next step after you caught the fish slop some water into an insulated bin and add plenty of ice. Drop the dead fish into this slurry as they come abroad then keep adding ice regularly in the bin. After this in next step at any break in the action, remove the gills and stomach and drop the fish back into a slurry and move on. After that when you reached at home remove the fish from the slurry and packed into an insulated container. Ensuring that each fish is well covered with ice and the stomach and gill cavities are also filled with ice.Making clean sweeping cuts is much easier through fresh that Has the consistency of soft balsa wood. After the cleaning, cutting and fillet process done. Wash properly fish from two to three waters. After cleaning the water your fish is ready to grill and fry. In deep fryer put some quantity of oil and after sometime out the fish in a deep fryer, an enjoy the healthy fry fish. In the end, Fishing is good for enjoy our weekend with family and friends in a better way. Fishing gives you a relaxing weekend. Afterfishing, you enjoyed your own fish which you caught with efforts. They give you a better taste and healthy meal on your dining table. There is nothing more frustrating than getting stuck in the middle of sea with the boat battery completely drained. Having a marine battery charger is utmost important for long boating tours. This is to ensure that the boat has enough battery to travel from one port to other. Today the market is flooded with numerous battery chargers. But before purchasing one, you should remember a few things. Before purchasing make up your mind what kind of charger you want a portable one or the one that is in your boat for all the time. An onboard charger is much useful as it can help you to charge your boat in the middle of the ocean when the battery dies. In fact these chargers are the sure short solution for emergency situations. On the other hand a portable charger is also not a bad choice. This will ensure that you have backup when the on- board charger is not working. Marine battery chargers are designed after keeping the marine environment in mind. That is why even their designs may vary from non marine chargers. The crucial factor to remember while choosing a charger is the way you are going to use the charger. There is usually any difference between marine batteries and non marine batteries. The only difference lies in the fact that they are constructed with non-corrosive material. Such chargers can easily distinguish between the battery chemistry rather than caring about the environment. For boats that are usually open and can easily be exposed to elements should prefer a waterproof boat battery charger. Ingress protection rating is considered when you go for a waterproof one. For example a waterproof charger with ingress rating IP68 can sideline the harmful effects of prolonged immersion in water and is dust tight. In case of large boat with cabin enclosed that has no contact with water can use a non waterproof charger. If there is vibration for long period in battery environment then vibration proof specification should be chosen. To handle vibration material which can dampen or decrease vibration should be chose. Sometimes the battery environment can experience stern temperature changes. In such environment a charger that can compensate these changes is successful. The two terms used to describe output of charger are amps and banks. The amps are determined by applications. With banks you can determine the number of batteries that can be charged at a time by the charger. For multiple batteries multiple banks can be used. There is an independent microprocessor for every bank. With independent output simultaneously batteries with varying size, type and charge status can be used. It is a fact that batteries for marine application are more probable to be flooded, be deep cycle or AGM. The important thing is to find out what is the chemistry of your battery. On the basis of this you can select the unit. It is mandatory in case of Gel Cell batteries it is important for the charger to be a gel cell one. At times chargers claim of being gel cell but indeed are AGM. It is important that you check the ignition protection feature of the charger. The marine engine and battery location usually are such which are prone to ignition. With this feature the sparks can be kept out while starting the engine which is surrounded by flammable gases. Go for the battery which comes along with a warranty. There are chances that battery may fail in marine environment. Go for a battery that is backed by warranty of 2 years or more. It is very important to have a proper charger for your boat. A good charger not only adds years to the life of the boat but also ensures safety. There are various kinds of batteries which require different chargers. The best thing about smart chargers is that when the battery becomes critically low, they will charge your battery. In the first go these chargers will charge the battery up to around seventy five percent and the pending battery is charged slowly. Single leg charger is used to charge a single battery at a time. In case of dual leg chargers you can charge two batteries at a time. And more recently now triple leg chargers are also available. These chargers can charge three batteries at a time. In trickle chargers by default have a time frame set in them as a result of which they close down after a certain interval. These chargers prevent your batteries from getting over charged and under charged. Why Do You Need A Proper Charger? Thus it is very necessary to have a proper charger for your battery. This ensures that your battery is full and you will not run out of the battery in time of need. To keep the battery in top notch position never compromise with the quality of charger. Get the best charger for the battery that increases its life. Switch to marine battery chargers and experience a pleasant boat ride. You will never be stranded in the middle of sea with these chargers. They will always maintain a particular level of battery in your charger. Thus experience a pleasant trip to beautiful lake in your boat with these marine battery chargers. Thus it will not be wrong to say that a good charger will not shorten your battery life. Get these chargers to your boat to prevent yourself from getting stuck in the middle of a lake. Get any kind of charger suited to you and add life to battery. It also increases the performance of the battery. Always purchase a certified marine battery charger and experience a pleasant journey. Have you been dreaming about having an aquarium in your house? Well, there are a number of things you'll require to pull that off. One of them is a fish tank filter. Unlike in the sea where the water is balanced and it's naturally fit for fish to survive, an aquarium is a man-made habitat. Why should you know the gallons per hour rate before buying a filter? The bigger the fish tank the more the water. Filters work in different GPH rate. You should know whether a filter will handle the capacity of your fish tank before you can buy it. If the aquarium is really big you need to get a canister filter over a corner filter. You get equipped with the right filter system and your fish will have no trouble surviving. You get the wrong one and you'll have yourself dead fish in your living room. The more the number of fish you want the more water you'll need and the larger the size of the aquarium. This means a more powerful filter and more energy is required. You need a filter system that can handle all the work without being overworked. If the aquarium is small then any fish tank filter will work with that because the capacity is less. Your filter system should be able to meet all these needs if the fish will survive. You might have the space to put the aquarium but not big enough to hang a filter at the back of it or beneath it. In this case, you need a filter that you can put inside the aquarium to save on space. If space is not a problem, then you're not limited to any type of filter and you can, therefore, choose the one you want based on all the other factors that are there to consider. Sometimes the aquarium is so big that it has occupied all the space you had allocated. It cannot function without a filter so you have to factor it in on the little available space. Everybody wants a good deal on items you buy. It is not any different when buying a fish tank filter. It is important to scout for prices in different shops and get the best deal. When you're buying everything together, that is the whole aquarium setup, you're more likely to get a discounted price for the whole bundle. If it's just a single item, it's also good to check for offers on the product. You don't want to spend much more on a filter than you did on the aquarium itself. The hardest part of any system is its maintenance. A fish tank filter is a system that is supposed to run all around the clock. This means it needs to be well maintained to be able to do the job well all day long. When you're buying one of these, please make sure that it has easy maintenance. You do not want something that will give you a hard time to clean or keep failing on you when it shouldn't. It should also be one that requires minimal maintenance. You may not have all the time in the world to babysit a machine. This goes down to maintenance cost. It is one thing to buy a filter at a good price and it is another to have to replace it every now and then. You want something that will last you long before you can plan on buying another one. There's no time that fish will pause their life so you can change your filter that keeps failing on you. Chances are that every time you replace it you'll also have to get more fish because some will die. When you're dealing with living things you have to ensure your equipment is reliable. Check that before you buy. The most important thing to look for in any product is how effective it is at doing its job. When choosing a filter, you want one that can do the best job. Get one that uses all the processes together. That is the biological, mechanical and chemical processes. That means you'll have a single machine doing the job of three different ones. If you got it at a fair price then that will be a win for you. Your aquarium will be free of any substances that can harm the fish and the water will be favorable. Some fish tank filters are designed to only fit in certain types of fish tanks. It is therefore very important to know the variety of filters that match with your fish tank. You do not want to purchase one blindly then get home to find that it does not fit into your aquarium. You could ask the vendor after you explain the type of fish tank you want to use it with. Then he'll guide you on which one is the best with that kind of fish tank. It will save you a lot of disappointment. Aquariums are beautiful sitting in your living room or your bedroom. However, it is a very delicate set up and for it to remain as beautiful, you need to take care of it. It's not that hard when you have the right equipment. Make a point of window shopping on a fish tank filter before you can settle on one. It all depends on your needs and the factors we highlighted above. Please make note of each one of them and consider them before you choose that perfect filter for your fish tank. The method in which people fish using fishing lures varies on a number of factors, however what many people do not understand is that the colour of the lure provides an excellent method to completely camouflage the lure so that all fish will attack your lure blindly, without making direct contact via sight. The right coloured lures, although the colour may seem strange to us, actually helps greatly to increase your catches, provided it is matched correctly to the water. This article explains how to make the correct lure colour choice. Many fishers often neglect to notice the water colour or the surroundings before throwing in a lure, many times fishers will use a realistic looking fishing lure as they have some success in all conditions, however this is not the most productive way to fish. When was the last time you looked at the water colour before choosing a lure? Or when was the last time you looked at a lure in the fishing shop and decided that this colour would be perfect for your local lake or river, rather than by how it looks to you. This is why I have created this article, 100 years ago most people would fish using strange coloured lures, that looked somewhat realistic but had strange patterns or colours which are not found in actual fish, or even in any fish in the water column you are targeting. The method being taught today is to trick your fish, choose a lure where by the colour is impossible for fish to spot before attacking, hence it will rely on only vibration and sounds in the water to hit your artificial bait, eliminating totally the requirement that the fish must visually see and assess your lure before making that final winning strike for the fisher. 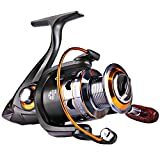 Below I will list the most common colour lures, remember that non-realistic lures are much cheaper than other lures, so by having the correct array of cheap coloured fishing lures, you can not only catch more fish but also save money. Black lures are perfect for fishing at night when there isn't much light on the water, if there is a strong reflection of the moon onto the water and the water is fairly clear, this isn't the best time to use black lures. Muddy minimal to no visibility waters are perfect for brown fishing lures, they also work really well at night. Green is perfect in conditions where the water appears a green colour, mostly this is often due to surrounding trees, grasses and foliage. If the water has a green reflection on it, then green lures are ideal to use. Direct sun onto the water can cast a yellow to orange reflection, this is the best time to use orange or yellow fishing lures. Waters which have a blue colour from them are perfect for blue lures, deeper water normally produces a dark blue water which has high visibility, shallow waters or even regular waters with some reflection of the sky can cast a more lightly coloured blue reflection. Choose a lure of the same colour and shade as the water. Gold and silver are more likely to be assessed visually by the fish, while they work, they rely on the fish deciding that visually this is actually something it is familiar with and will want to eat. Bright days with lots of white clouds is perfect for white fishing lures, as is patchy cloud days with bright sun. Works best is slightly murky waters with some visibility. Prior to you begin this pastime, make certain that you have fundamental expertise of angling. They prepare to go to an angling location on weekend breaks and also objective to capture particular fish with specific attraction. Generally, you could ask various other fish fanatics concerning their experience in angling. You could look for some angling manuals. It's not difficult to begin angling if you have a wonderful interest in this pastime. 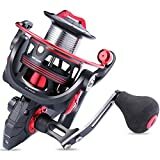 As soon as you understand some fundamental angling guidelines, start on a great day to exercise just what you had actually kept reading angling manuals such as how you can include angling lure to your hook, ways to cast your line as well as how you can knots prior to wandering with wind in the watercraft, and more. 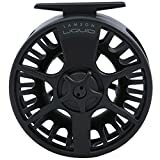 When it involves angling suggestions and also techniques for newbies, you need to understand that newbies could take advantage of a particular reels as well as poles. In fact, they are easy for every person that simply starts to cast. It is not advised to open up the angling reels of what are simply starting. Understand the sort of fish you wish to capture as well as you will certainly understand the best ways to locate the ideal lures to bring in that fish. Bream fish is drawn in by pests like worms or crickets while catfish suches as lures made from raw hen liver. Discover areas where fish usually lives about. Some fish simply live along rivers. The weather condition could choose your fishing expedition. The cloudy skies is the most effective weather that could make your angling effective. Consider your gown when going angling, due to the fact that you have to be close to water surface area. Be certain that you put on layers considering that the weather condition could transform via your angling day. You have to prepare lures to capture fish. If you do not have any type of food to eat at noontime, you will not have adequate power to proceed your fish capturing. Remember to prepare an insect repellent to obtain eliminate pests as well as insects near brushes as well as water. If insects disrupt you, definitely you will certainly obtain impulse and also can not concentrate on your angling. If you have toddlers, do not bring them to your angling location. Due to the fact that they could make you shed your focus while angling. Several freshwater fish consume at sunset as well as down, so sunset as well as daybreak are optimal angling hrs. Strategy to capture fish at the correct time as well as you will certainly fish treasured big wheel. It is suggested that individuals need to capture fish in locations where the water is tidy as well as fish is healthy and balanced sufficient to consume. There are some locations individuals are not enabled to fish openly as well as simply one that has angling permit could fish. Fish catchers have to exercise numerous angling policies connected to fish dimension, angling time, the age enabled to obtain an angling certificate. 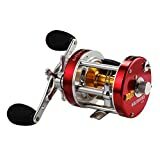 There are 2 fundamental kinds of reels: lure cast reels as well as rotating reels. The lure cast reel up and down spool when you hold the pole while rotating reel vertical spindle to the pole. Rotating reels are usual for novices and also that are hassle-free in shut or open selections. Buy angling saved as well as select ideal poles and also reels. There are various type of these products and also you ought to pick ones that match your budget plan. Usually, novices must select a post in medium-length dimension as well as a pole that is about, versatile as well as solid sufficient to capture big wheel. The smaller sized lines as well as hooks, the much better the possibilities of fish's attacks. When angling, your hook requires to fit the details fish you desire to capture. When it comes to angling suggestions and also techniques for novices, you need to pick hooks that fits lots of kinds of fish (dimensions from 8-- 5/0 are proper for numerous fish). 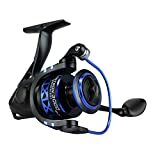 You ought to pick online lures to raise the possibilities of capturing large fish and also have genuine angling experience. If you live in a countryside where insects live along financial institutions of streams, you could capture insects, crumbs or minnows with webs. 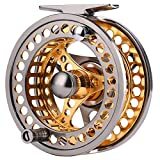 Fish catchers have their very own favored lures, and also you, as a newbie could take into consideration making use of online lures such as worms, insects, salmon eggs, hen liver, shrimp, cheese or bacon to bring in fish and also capture them. There are various lures you could prefer to capture fish, such as online lures or artificial lures (rainbowlike as well as intricate plastic appeals). 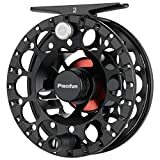 Depending upon the sorts of reels, you could launch the line. If you have a rewriter real, the launching the line is so very easy-- easy. Press the switch to launch your line when you indicate the appropriate instructions, press the close switch. Bring the pole to your side in the instructions that you wish to cast. Launch the line when you have actually aimed in the ideal instructions. If there is no fish touch your lure for 10 to 15 mins, cast elsewhere and also make your angling traveling boring because means. Numerous anglers begin reeling in gradually snagging the lure in order to offer fish perception that lure is active. According to knowledgeable fish catchers, you should not quickly begin reeling as quickly as you have actually cast. As an angling method, you must obtain a loosened line. A loosened line supplies a possibility for your fish to "toss the hook" right out of its mouth. By maintaining stress on the line you will certainly make sure that the hook stays in the mouth of the fish. Never ever utilize your reel to draw in fish, (yet you could do for little fish). Utilize your arms to draw the fish towards you, following reel in a slackline. When you really feel the line is taken or really feel a yank on your line, you could wish to begin establishing your hook. 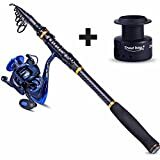 Just offer the fishing pole a company as well as fast jerk up as well as backwards. If the fish gets on the line, it promptly resists as well as the line will certainly adhere to activities of that fish. Often, it could be hard to understand specifically whether you obtain a bite or it's simply a sensation you point a fish is encountering your lure. It's the technique that could assist you solve sensation and also experience regarding it. When you obtain a fish reeled in, bring that fish in with your internet. Be careful of the sharp hook as well as sharp backs of fish as they could be sticking out with your fish's mouth. Numerous companies shield types of fish as well as they do not permit you to capture any kind of fish or bring them to the side of loss. When you capture a fish, procedure that fish by adhering to specific requirements. Despite launching or maintaining fish, back the hook out delicately to make sure that the fish is conserved from blood loss and also it will certainly raise its endure. It's hope that these 22 fundamental angling pointers as well as methods for novices are valuable for you. 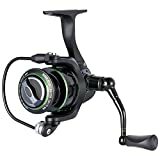 You ought to exercise a lot more, have extra angling takes a trip to make sure that you could enhance your angling abilities to greater degrees. Capture treasured big wheel and also have actually healthier meals made from your very own fish! For more information please make sure to check out Miami Fishing Charters. While 6-weight fly rods are the most versatile, multi-functional, and all-around fly rods, there is, it’s still hard to choose the best 6wt fly rodif you do not know what to look for. So, in this article, I reviewed five of my favorite high-rated products today. But do not become overwhelmed or confused about choosing a rod just yet! To help you choose the best one for your needs, I also included the most important things you should consider. So, what are you waiting for? Read on to find out more! What’s A 6wt Fly Rod? 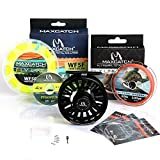 What to Look For The ﻿Top ﻿6wt Fly Rod? First on the list and my best pick among all listed here is the Fenwick High Modulus Graphite (HMG) Fly Rods. These are easy to use medium fast action rods that many users recommend, including me. The graphite material not only gives the rods a nice stylish appearance but also makes them very light and comfortable to use. This latest version also offers a forgiving action for higher accuracy and line speed. These rods are very user-friendly. It has matte smoke stripper guides and double foot snake guides. The stripper guides also have wide diameters for smooth and efficient casting. The matte black blank has four sections and features a carbon binding. This Extreme Graphite Fly Rod from Maxcatch is not only relatively cheaper but is also the most popular product out of the five. If you couldn’t afford the Fenwick HMG set, this is a great alternative. Many who bought this said they are thoroughly impressed and very satisfied with their purchase. Well, this is not hard to believe given the many features this rod has to offer. First, it is made with pure IM6 24T carbon fiber material featuring an innovative A-Helical technology for sensitivity and strength. 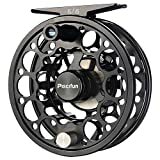 This medium fast action fly rod is also lightweight, slim, and adequately tapered for better line control and quick, accurate, and powerful casting. 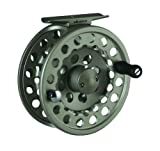 The durable and light reel seat is made of solid airspace graded 6061T aluminum steel and had twin locking rings. The handle is made of A-grade, high-quality cork. It even has corrosion-resistant hard chrome, stainless steel snake and tip-top guides for a smooth performance. The ceramic ring stripping guides also reduce friction and allow you to control the line better. 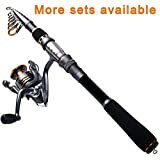 This package includes four-rod pieces and comes with a plastic rod tube. Maxcatch also offers 1-year warranty on all of their gears. If you’re looking for a fly rod that performs well but doesn’t break the bank, Piscifun came up with this affordable yet high-quality graphite fly rod set. 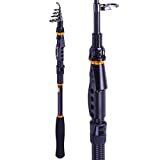 Great for general trout fly fishing in rivers, streams, and other moving freshwater bodies, this medium action rod features a universal size that both beginners and experts will benefit from! This high-performing rod set is made with quality IM7 graphite for accuracy, durability, and performance. The machined aluminum reel seat is also equipped with double lock rings to ensure the secure attachment of the reel. Additionally, it comes with chrome guides and ceramic stripping guides and inserts for the smooth release of fly lines. The materials used are lightweight and paired with a PVC rod tube for protection and portability. The rod itself has guiding white dots for better and easier alignment. The competitive half wells cork handle makes it comfortable to use and prevents hand fatigue while also adding accuracy. The handle is also lightweight, warmer to the hand, and more sensitive than EVA. 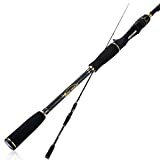 On the other hand, if you don’t mind spending more for an ultimate rod, the TFO BVK Series Fly Fishing Rods is a good option for you. 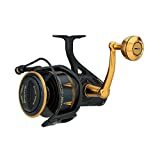 Although the most highly priced in this list, it is probably the lightest rod with the best presentation you can get for aggressively strong and powerful performance. The construction of this series revolves around using the best and lightest materials that can meet the highest performance standards. These fast action rods are said to perform excellently with distance. The translucent olive-colored blanks are matched with braided carbon fiber reel seats. The Flor grade grips are also fashioned and contoured for comfort. Another good feature of this product is the exclusive Tactical Series anodized steel stripping and snake guides that are impregnated with lightweight ultra hard-chromium for durability. On top of all that, the series is advertised to perform great and last long both in freshwater and saltwater. It even comes with rod tubes although the quality should not be expected to be that good. Last but not the least is the Crosswater 690-4 Fly Rod by Redington. 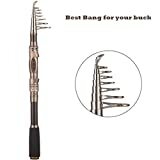 At a competitive price, you can get this rod set with good quality and performance. 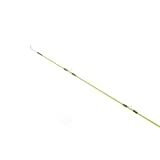 This medium action rod is specifically made for freshwater fly fishing in large rivers or smaller streams. The lightweight construction allows for versatility while the large arbor design lets you retrieve quickly and easily. 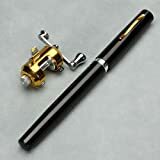 At first glance, I immediately noticed the stylish appearance and trimmed details of the rod. It also has helpful alignment dots for easier setup. You can even easily switch from a left hand to a right hand retrieve and back. 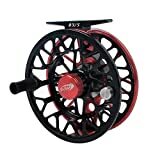 It also has an anodized aluminum reel seat that makes it durable and suitable for most fly fishing applications. The strong disc drag system also gives you greater control and power over larger fish. The rod comes complete with a Crosswater reel pre-spooled with quality RIO MainStream fly line and a RIO tapered leader. Included in the package is a rod sock made of black cotton while outfits come with a navy blue reel and rod case. Everything is backed by a 1-year company warranty. We’ve been talking about fly rod weights since the beginning, but what does it really mean? Unlike what you might assume at first, this “6 weight” level does not refer to the weight of the rod itself. Instead, this corresponds to the rod’s weight class or the specific weight rating of the fly line it was made to balance with. Fly lines are classified by a weight system depending upon how much the working portion of the first 30 feet of the line weighs in units called grains. A grain is a unit of measure used for the portion of the line without the tips or tapers of a fly line. Usually, however, what’s important is knowing these measures relative to another line or rod instead of knowing what they actually mean. So, a 6 weight rod means it is made to match a 6 weight fly line. This weight rating is the most important factor when choosing a rod for fly fishing. Typically, rods with the same rating from different manufacturers perform differently from each other. Also, a fly rod with a faster action tends to fish more heavily than a rod of the same weight but with a slower action. Although fly rod weight comes in a range of 1 to 12 scale, freshwater weight ratings only range from 2 to 10. 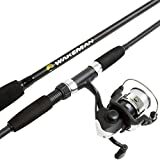 To give you a better idea about each weight rating, a rod of 3wt can handle panfish and small trout while a 9wt rod is used for ocean and large saltwater fish or large bass. For this reason, 5wt to 6wt rods which are more or less in the middle of the spectrum are the most popular. These can be used for both small fish and heavy, large game fish. It provides adequate power for heavier flies. It can be used for deep waters both in freshwater and saltwater. It can cast longer than a 5wt rod. 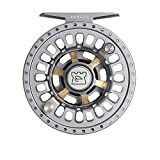 It can handle most fly lines with a 6-weight rating or less, which is the most common kind you can find. 6wt rods can either be medium-action to fast action. 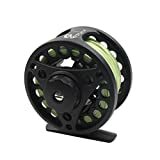 What to Look For The Top 6wt Fly Rod? Aside from the rod weight, some of the other criteria I used in choosing the 6 weight fly rod. 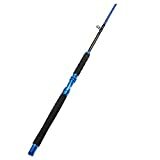 They are rod action, length, and material. Slow action rods are the most beginner-friendly and flexible. They are great for those who are just beginning to learn since their flexibility allows for better fly presentation. However, they are more difficult to control on the backcast, and their usability is limited. Medium action rods fall between stiff and flexible. 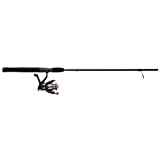 They offer longer, harder casts than slow action rods but allows better cast control than fast action rods. Fast action rods allow for very little bending and are the stiffest of all types. 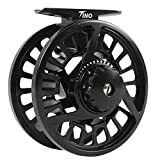 This gives them the ability to perform better in providing more powerful casts over longer distances. 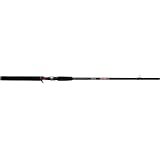 However, using fast action rods require experience and skill so are often used by advanced anglers. The downside of fast action rods is that the casts can be too hard and might scare potential fish away. Generally, rods range from 7 feet to 10 feet long, but 9 feet rods are the most common. Longer rods give more power while casting and are ideal for high stick nymphing or for covering long distances. However, longer rods can also get caught more easily in the brush, or branches and creeks. So, if you prefer hiking or trekking to remote tributaries but don’t need very long casts, choose a lightweight rod that’s 7 to 8 feet long. For larger bodies of water with less brush and vegetation, 9- or 10-foot rods are your best bet. Based on this, rods 8 to 9 feet long are the most versatile. Different materials are used for fly rods, but the most predominantly used are fiberglass, bamboo, and graphite. Fiberglass rods are durable, cheap, and beginner-friendly. However, graphite rods are gaining more popularity nowadays. If fiberglass rods are ideal for beginners, bamboo rods are for those with experience. They are naturally slow-action rods that are heavy and require great care and maintenance. They are generally considered the best looking regarding aesthetics due to their natural and rustic feel. The latest and most popular rods available today are made of graphite, such as those listed here. Graphite rods can be quite heavy or also very light. They are lighter than fiberglass rods and provide more accurate and longer casts. Graphite rods are considered the most sensitive among the three, which is why they are preferred for easier spotting, hooking, and keeping a catch. 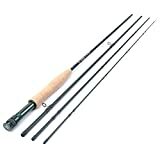 In choosing the best 6wt fly rod, it is important to consider factors like action, fly rod length, and material. Other features are just secondary to all of these and depend on your personal needs and preferences. I personally chose the Fenwick HMG Fly Rods which are medium fast action rods that are user-friendly, accurate, and durable. The bundle is also relatively cheap, stylish-looking, comfortable to use, and is covered by 5-year warranty. Spinners are small, metal fishing lures with blades that spin around a body to attract fish. The spinning motion reflects light and sends out subtle vibrations in the water as would a small fish. This fools your target fish to bite your bait or hook. While spinners can be very helpful, they don’t have too much of a benefit when used incorrectly. Several tools or techniques should be applied. A good vest is very handy and will give you plenty of compartments and space for equipment, tools, and tackles. In order to catch any fish with spinners, you will need a nice combination of a rod and a reel. 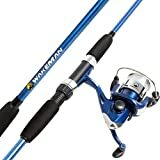 Spin fishermen often prefer shorter and more sensitive gears, such as a 5- or 6-foot light or ultralight rod and reel model. 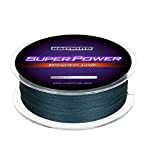 * A 16- to 20- pound monofilament line when fish are sagacious or hesitant to eat or bite your bait. Although spinners qualify as baits, minnows, spoons, small crawfish, insects, salmon eggs, and other types of bait can be used. When fishing for game fish like trout, carp, and catfish, popular baits include power baits and dough baits as well. When fishing, you also need small, simple tools. These include forceps to unhook your fish, pliers to cut the line, and spare hooks, lures, baits, floaters, rigs, nets, spears, and the like. Standard Inline which are weighted spinners with rotating blades around a straight wire using a clevis and a bead stop. These have a molded lead head on the lower arm. Spinner baits which are shaped like unclosed safety pins with a single hook and a weighted head. It is used to catch game fish through and inside vegetation or cover. Buzzbaits which are similar to spinnerbaits or inline spinners with a specially designed propeller designed for surface fishing. Live Bait spinners use minnows or nightcrawlers on one hook or a series of hooks. A spinner blade is attached in front of the live bait. Bottom Bouncing is used for casting from upstream of a river, usually from an inflatable dingy or a boat during trolling or in current fishing in wide freshwater bodies. 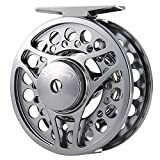 It is effective for catching brook trout, cutthroat trout, bull trout, and rainbow trout.​ Remember to use fishing spinners for trout. ● Cast the spinner behind the boat or upstream until it touches the bottom. ● Allow the spinner to bounce on the bottom while moving downstream. The motion will bring up the mud, and the commotion should attract your target. 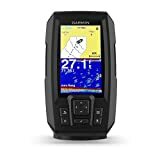 ● Quickly retrieve your line with the current so that the ﻿﻿﻿﻿﻿﻿﻿lure works fully. This technique uses traditional live baits and gears. It is often used in naturally flowing freshwater bodies like rivers of streams from an anchored boat. Live lining allows the bait to go under and through cover, rocks, holes, and other places where gamefish could be hiding. ● Cast your line and allow the bait to reach the bottom. ● Retrieve so that the baitfish rises but not too far from the bottom. The current and the movement of the baitfish should help you here. ● Keep your bait close to the bottom. ●Prepare some chum from a tackle shop. Some offer special mixes intended for specific fish species. If you don’t want to spend too much, you can use some bread, bread crumbs, canned corn, or pet food. ●Throw some chum overboard into the water. Approximate the amount of chum you should use to attract the fish nearer but not get them full. ● Wait for a while before casting in the chummed spot. ● Make a habit of regularly throwing chum on the same spot to make it a good fishing spot. ● Cast and allow your line and lure to settle a little. 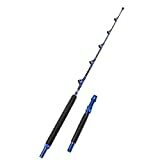 ● Hold your rod at a medium height of 1 to 1.5 feet above the water’s surface, slightly angling it down with the tip close to the water. ● Move your rod from left to right using your wrist, making a wider movement than you want your lure to move. ● Maintain a slight slack on the line before and right after each jerking motion by slowly and steadily reeling out. This resists drag, allows the lure to keep moving, and allows it to move naturally. ● Keep your eyes on the lure and slowly allow it to move down until the rod tip almost touches the water. Then, without pausing, snap the rod back to the original position while preserving some slack on your line. 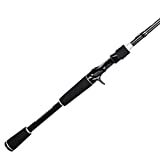 ● Deliver a non-stop alternating series of strokes and jerks so that the lure zigzags about six inches from side to side. Remember that the rod tip should move wider to overcome the slack on the line. ● Try to maintain a steady rhythm until you retrieve. Jigging is a popular method performed to catch different fish species by modifying or changing the rigs’ shape, play, color, and movement. This is often used for catching saltwater fish from deep waters. ● Cast and wait until your jig or lure touches the bottom. ● Use the rod tip to make the lure hop and then lower it back down. ● Avoid bringing the rod too high because this will prevent you from hooking properly when a fish bites. ● Continue reeling down to lower the bait and reeling up to pull it from the bottom until you feel a bite. To give you a better idea of how spinner fishing works, here’s a very helpful and informative​ video. You might also like: What Is The Best Way To Kill A Fish? After catching fish, the next thing to do is to kill it. So what’s the fastest, easiest, most humane, best way to kill a fish? While some people would prefer to let the fish thrasharound to slowly die before icing or cleaning them, this method is actually cruel, inhumane, unethical, and generally inadvisable. For one recent studies show that fish are actually feeling creatures. So when you do this, they feel unnecessary pain and distress. Also, this reduces its value, freshness, quality and also decreases the storage life of the flesh. 1. Live chilling in the freezer or ice water - it slowly suffocates the fish. 2. Cutting and bleeding out the gills before stunning - this is extremely painful for the fish. 3. Exposure to air or removal from water- this also violently and painfully suffocates the fish​. ​Now that we’ve ruled those out, here are the different easy, quick, and humane ways to kill a fish. Three methods are preferred by most anglers, fishermen, cooks, and food handlers. ​Percussive stunning, simply put, is a blow to the fish’s head using a blunt object. It is arguably the quickest and easiest method of killing a fish. How to Stun a Fish? To do this, just deliver a fast, firm, hard blow or knock on the head of the fish at the top of its skull behind its eyes. You can use a heavy wooden or metal club called a “priest” or a small club made specifically for this purpose. This delivers a huge, sudden impact on the brain to instantly kill the fish or cause it to become unconscious, thus the term “stunning”. The blow should have enough mechanical force to reach and be absorbed by the brain and disrupt its neurological activity. However, it should not be too powerful as to crush the skull. Most smaller fish can be stunned by holding the fish in one hand and using your dominant hand to strike it. If you’re handling larger fish, you can lay them on its belly on a flat, steady surface. Rotate the fish in your hands while observing the eyes to test the eye roll reflex. If the eye does not move, the fish is either dead or unconscious. Look at the operculum or the structure covering the gills. If these do not rhythmically open and close, the fish is dead. Place the fish in a bucket of water. If it sinks and no movement is seen as an attempt to swim, the stunning is successful. ​Once the fish is confirmed to be unconscious or dead, you should now let it bleed. Bleeding is done to maintain the freshness and high quality of the flesh. To do this, turn the fish so that its belly is facing up. Look for the thin flap of skin tissue between the base of its throat and the gills. Hold the fish by the head using one hand, pointing the throat away from you and with your finger hooked around the flap. Next, pull the flap to cut or disrupt it. Two large blood vessels located in the throat should open and gush out blood. Let the fish bleed out for a while before removing its ﻿﻿guts, cleaning it, and icing it. Percussive stunning is commonly used when dealing with strong, large, and potentially dangerous fish like halibut, mackerel, tuna, sharks, and such. Usually, several blows may be required. It can also be used for salmon and trout. However, it may not be effective for fish species with hard skulls or those that are significantly different regarding anatomy. For these fish, you may need to adjust the position so that you can strike nearest to the brain or use a different method. Cutting or destroying the spinal cord of the fish also renders it dead immediately and so it can also be the best way to kill a fish. To do this, you should first identify the part of the fish called the throat latch. It is located between and under its gills. Then, holding it with both hands, bend the fish’s head back sharply using a swift movement. This breaks the spine and severs the spinal cord.Not only does this method kill the fish instantly but also lets it bleed out thoroughly without doing another extra step. Iki jime is a Japanese technique also known as spiking or pithing. It involves piercing and destroying the fish’s brain using a sharp metal object such as a screwdriver or knife. There are also specialized iki jime tools that you can buy from some tackle shops. Iki jime is a precise process and requires some skill. But, if mastered, it can be the a good method to kill a fish because it causes the least amount of stress to the fish and improves its value as food. The first thing you need to do is to find a soft area of the skull close to the brain (Refer to the figure below for salmon and trout). Remember that this may vary among different species. After pithing, you can now clean and ice your fish. Afterwards, it is ready to be skinned, filleted, or cut. Depending on the fish species, your skills, and personal preference, these three different methods may be considered as the best way to kill a fish. However, in real life, a combination of two or all of these is used for optimum results. How big do minnows get? Do they grow bigger as time goes by? Are there any contributing factors to how big these fish can get? If there are, what are some of these factors? And how do they contribute to the growth of minnows? Do any of these questions sound familiar? If they do…you are NOT alone. And this is because minnows are only known to be a super tiny fish family often used as bait for catching bigger fish. When you read some articles that talk about minnows, you’ll find that there is very little information about this particular subject. There aren’t many resources explaining exactly how big minnows can get. So with this in mind, let’s take a quick look at some basics about minnows, what it is about their size and how “big” you can expect them to grow. How ﻿B﻿ig ﻿D﻿o ﻿T﻿hey ﻿G﻿et? The word “minnows” is frequently misunderstood. Some people think that all small fish are minnows, but in actual sense, it is a scientific reference. Minnows are way above 2100 species all over the world, and it is expected that most of them, if not all to grow to about 3- 4 inches long, although there are exceptions, given a large number of species available. With a large number of species belonging to the same group, it is inevitable for interbreeding among them to take place. It thus means that you cannot accurately determine the length or size of a particular minnow without considering such vital elements. Therefore, determining a particular size or length for minnows cannot be pegged on specific factors given that the breeds vary significantly and also the natural elements also affect the concrete answer to the question. But one of the compelling aspects that you also need to understand is the fact that there are different types of minnow﻿s. Some of these minnows share a considerable number of features given that they belong to the same family but also have other different characteristics. It thus implies that the size when they are fully grown also vary, albeit insignificant to tell. The most common one is the fathead minnow, which is arguably used in a wide range of applications including, laboratory tests, fish feeders, water toxicity tests and fish baits among others. It is also the type of breed that many anglers across the world prefer using in their day to day fishing activities. Nonetheless, it is vital to make sure that you carefully identify this species when perhaps purchasing them for breeding purpose. It is because most of them look like small cyprinid and thus can be relatively difficult to identify accurately. If you’re keen enough, you should realize that minnows have an incomplete lateral line. Another outstanding feature is the terminal mouth. Although, some minnows will have underslung mouth even when fully grown. Minnows do not have teeth in the mouth but have what is referred to as pharyngeal teeth, which enables them to grind the food at the throat. Minnows also have a dark spot on the front area around the dorsal fin as well as a stubby first ray on the dorsal fin. Again, these two features are shared by some of the members of the same Pimephales genus. If you’re a budding lake or fish pond manager or angler, then this is an essential concept that you need to understand. One thing that you have to note is that the minnows, especially fathead, feed on almost everything that is available for them. They’re heavy eaters; it does not matter what type of food whether it’s wild algae, insects or plankton. When confined, they can also eat anything including shrimp, flakes, tubifex, and bloodworms among others. In general, some of them are omnivores whereas others are carnivores, so it also depends on the particular species. Determining how big the minnows can get varies from one species to another given that we have over 2100 species. For instance, how frequently they eat determines how fast they grow. Some of them such as the fathead, which is commonly used, however, grow to about three inches long or slightly above three inches. There are some such as the creek chubs that grow up to 10-12 inches. Gold shiners grow up to between 6-7 inches whereas shiners grow up to about 5-6 inches long. The actual optimum size of these organisms entirely depends on the particular type of species and other environmental factors surrounding their breeding. But you also need to know that you can’t expect them to grow to 5 pounds of fish however much and long you breed them. Minnows are just minnows, and that is the reason they are used mainly as baits. The lifespan of minnows mostly ranges between 12 to 24 months. During this time, they reproduce a minimum of between three to six times before the end of their life cycle but depending on how frequently and sufficiently they feed as well as how conducive the environment is. Some minnows turn into a predator where they end up eating their young ones, which may prevent them from growing big as expected. This is however exceptional on fathead minnows which only grow to their optimum level without predating on themselves for whatever reasons. As much as minnows tend to be relatively small in size, it is also ideal to understand the nature of how they reproduce. Often, they spawning during spring or early summer. However, this also varies depending on the specific species. But the variation in temperatures also plays a pivotal role in determining how large they get and how fast the growth takes place. Some species have an elaborate method of spawning. For instance, in some species, it is the male who constructs sort of a make-up nest, where the female deposits the eggs and the male ultimately fertilizes them, guard the eggs for a particular period until they hatch. The most important thing when looking at how big minnows can get is by simply understanding that they are different from small fish. Their growth activities are different and thus the reason that leads to a difference in the sizes after they are fully matured.